While traditional finance focuses on the tools used to optimize return and minimize risk, this book explains how psychology can affect our decisions more than financial theory. Covering the ways investors actually behave, this is the first book of its kind to delve into the ways biases influence investment behavior, and how overcoming these biases can increase financial success. An easy-to-understand structure, illustrating psychological biases as everyday behavior; analyzing their effect on investment decisions; and concluding with academic studies that exhibit real-life investors making choices that hurt their wealth. A new chapter on the biology of investment, exploring the latest research on genetics, neuroscience, and how hormones, aging, and nature versus nurture inform our investment behavior. An additional strategy for controlling biases, helping readers understand the psychology that motivates markets and how to address it. Experiential examples, chapter summaries, and end-of-chapter discussion questions to help readers test their practical understanding. Fully updated with the latest research in the field, The Psychology of Investing will prove fascinating and educational for advanced students in investment, portfolio management, and behavioral finance classes as well as investors and financial planners. John R. Nofsinger is the William H. Seward Endowed Chair in International Finance and Professor of Finance at the University of Alaska Anchorage, USA. "Nofsinger does an incredible job explaining why we sometimes make poor investing decisions. Read this book and save your wallet from self-inflicted pain and anguish!"? "Each new edition of The Psychology of Investing offers added breadth and depth on this fascinating subject. Investors who lack awareness about the psychological aspects of finance can be their own worst enemies. 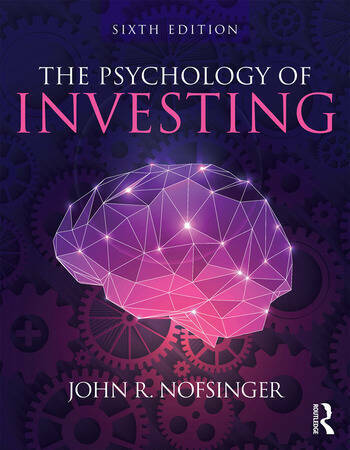 Nofsinger’s current update of this highly insightful book is a must-read for all investors interested in improving their chances of achieving success in the market."